Spoiler alert - nothing major given away but a warning nonetheless that this piece is mostly intended for those who've already seen the movie or who have no real plans of seeing it. OK, you want me to say it. I'll say it. I did not love Christopher Nolan's Inception. Why? Because I didn't buy it. I didn't buy the premise on which the whole movie stands. I'm not talking about the dream extraction stuff either. As Kafka so perfectly illustrated, you can have a character wake up and discover that they are a bug and we'll believe, we'll follow; it's what you do with that make-believe world and what it has to say that's gonna tell us whether we remember your story or not. The attempt at an emotional core in Inception is the story about DiCaprio dealing with the loss of his wife. An attempt? Already readers are angry. Comments coming in about how you cried during certain scenes, and how you felt their love so strongly, or felt DiCaprio's pain as real. I too felt the tugs on my heart strings at times, most notably during the windowsill scene. It was, however, in hindsight, as I walked out the theatre so underwhelmed and disappointed that I hadn't loved loved loved the movie that I began to put the pieces together and came to find there was an emptiness to that whole central conceit (but more on that in a momento). made the world take notice of this new and obviously hugely talented director. We, the viewers, felt stuck in that hotel room with the main character, Leonard. We were as lost and confused and claustrophobic as he was and the experience was riveting, worrying and so satisfyingly gripping. But a key example of what for me, especially on multiple viewings, took Memento into a whole other realm of achievement was actually a subplot. Granted, it was the key to the whole understanding of the movie, but it wasn't the central action. AMC, the TV channel that produces Mad Men uses the tag line: "Story Lives Here." I read it somewhere (an issue of Esquire perhaps?) that they are using this brilliant slogan as a counterpoint to the moronification of the Hollywood blockbuster; so that high quality TV shows like The Sopranos and In Treatment are where adults who actually like stories can go when $12.50 ($18 in Japan) just might not seem worth it for The Prince of Persia. For story to work we have to care about character. Star Wars had light sabres and special effects but no one would talk about it ever again if not for Luke and Leia and Hans Solo and of course Darth Vader. Even 2001: A Space Odyssey, a movie so cold and seemingly devoid of speaking human characters you would think it impossible to relate that film to character, has alongside its space visuals and groundbreaking use of music the character of Hal, the computer that is possibly the most memorable and chilling aspect to the whole grand movie. But back to Inception. DiCaprio is becoming a world-class movie star. 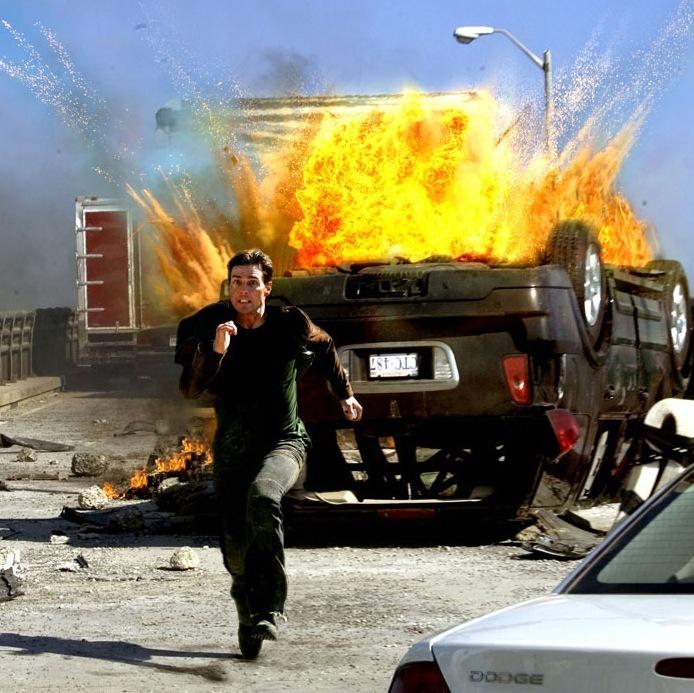 He has the intensity and the ability to share vulnerability that Tom Cruise had before he became a Scientologist (see Cruise in the 80s, some 90s), when he decided to replace actual acting with, as my wife so aptly put it, running ("That's all he does now in his movies," Ai says of Cruise. "He just runs.") I don't blame DiCaprio for Inception's disappointments, far from. Like with The Departed he's proven here again that he's no longer a boy; he's finally figured out how to get his poster off pre-teen girls' bedroom walls. Ie. men now have respect for the guy. No, DiCaprio is not the issue. The fault here lies squarely with the director, with Nolan. Inception looks amazing and may possibly give viewers the kind of thrill I remember getting seeing Terminator 2 for the first time in theatres, or, slightly more recently, The Matrix (whose dating himself now?). The problem with Inception is I felt no real sense of danger. I was not nearly as anxious or curious as to what the hell was going on watching Inception as I had been with Memento, was not nearly as gut-twistingly terrified at the same time as I was thrilled experiencing The Dark Knight. With Nolan's latest I just didn't care enough. The film pivots on the importance of DiCaprio's character getting back home (to America) to symbolically let his dead wife go and see his kids. The problem, as David Denby in his New Yorker review of Inception so aptly put it, is that we never get to know these children in the slightest (only the image of the backs of their heads) so that we don't care about the kids, nor did I get any sense of DiCaprio as father. If a two and a half hour movie revolves around someone getting back to something the audience needs to have some semblance of reason why we should care for that something other than just a Kodak commercial's picture of it (or the back of the heads of it). Perhaps if Nolan had had the courage to cut fifteen minutes from his James Bond guns-on-ski-slopes action sequence to actually let us see DiCaprio as father... maybe then something might have resonated. Somehow, though, even that kind of quick fix flashback would have rang false, and I think I know why. In The Dark Knight we had characters to terrify and beguile and trouble the mental stability out of us (Heath Ledger's Joker), and we also had characters to truly love for their integrity (Gary Oldman's Commissioner Gordon). What, on the other hand, do your remember about DiCaprio's wife in Inception other than that she was French and beautiful and had an unusual first name (Mal)? What of DiCaprio's character himself? He was intense and focused and driven, but I can't even remember his character's name let alone care about his pain. What rang so hollow with Inception? Why did I walk away not caring about any of these people? Because I think that the entire premise, I think that the letting go of a dead wife and the getting back to see his children were merely devices to drive a plot about an idea (something to do with memory and dreams and dreams within dreams) that was never nearly as interesting as Nolan may have thought. There are, to be sure, ideas movies where the premise is so astonishing that we can get over the ever-wooden ways of one Keanu Reeves, but as it turns out The Matrix Christopher Nolan's Inception is not. Another Movie Smart, With Heart : "An Education"